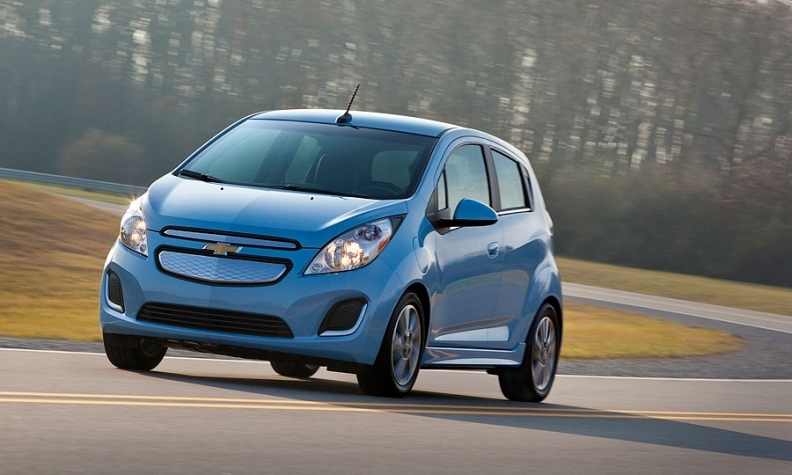 The 2014 Chevy Spark EV will get the equivalent of 119 mpg in combined city and highway driving. General Motors said today it plans to double the amount of models that achieve 40 mpg highway or better by 2017. The goal was outlined in a June letter by CEO Dan Akerson that was included in the company's 2012 Sustainability Report. The Chevrolet Volt, Sonic, Cruze Eco Cruze Clean Turbo Diesel already meet that requirement, and the 2014 Cadillac ELR and Spark EV will surpass it when released. "Sustainability is not only a key part of how GM is shifting from a good to great company, it is about the leadership and innovation that can transform the auto industry," Akerson said in a statement. "Our long-term approach to sustainability enables us to increase efficiency and re-imagine personal mobility to best meet customer needs and lifestyles." Akerson wrote in the letter that GM is making its vehicles more environmentally friendly by reducing vehicle mass and improving the thermodynamic efficiency of its gasoline engines, among other things. He said the national CAFE program — which will require new cars to achieve an average fuel economy of 54.5 mpg by 2025 — sets "realistic targets" for automakers. Though the concept of electrification is slowly becoming reality throughout the industry, Akerson wrote in the letter that GM is dedicating more resources to use electricity to help improve performance and fuel economy. GM aims to have 500,000 vehicles on U.S. roads "with some form of electrification" by 2017. By 2016, GM also plans to reduce average fleet CO2 emissions by 15 percent in the U.S. For Opel and Vauxhall in Europe, the automaker hopes to reduce fleet emissions by 27 percent by 2020.